Hated, unjust and unworkable. 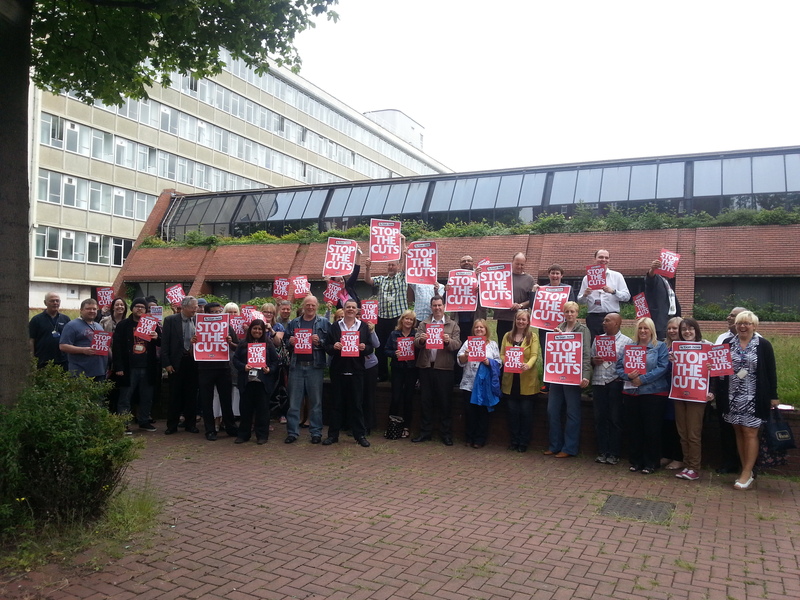 One year on the Bedroom Tax is still there – but only just. Campaigning locally and nationally has had an effect. * In Scotland the Tax has been defeated. * Pressure has meant the Labour Party has promised they will abolish the tax. * Birmingham City Council has admitted 3000 people in long term tenancies had benefits taken away in error and they will be given a rebate. 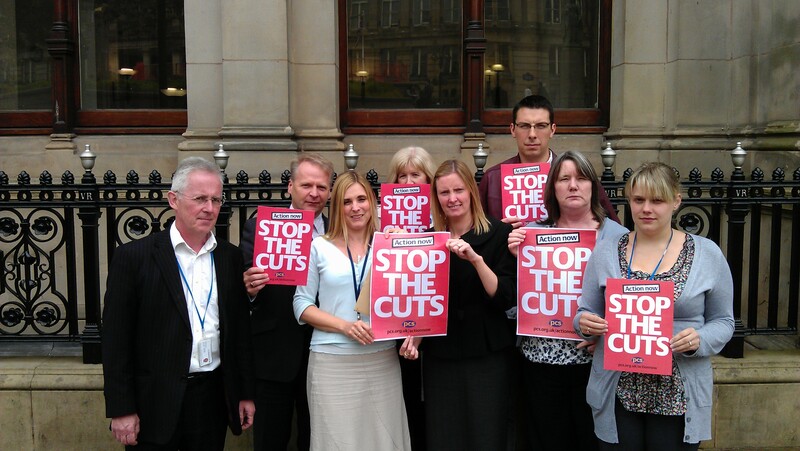 144,000 further job cuts in the public sector. 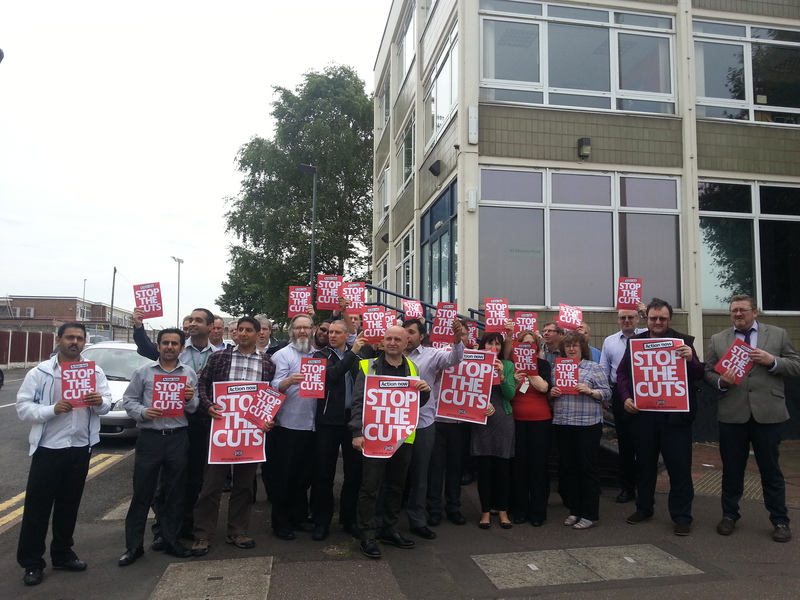 These cuts will have a devastating effect on you, your family and the services we provide. 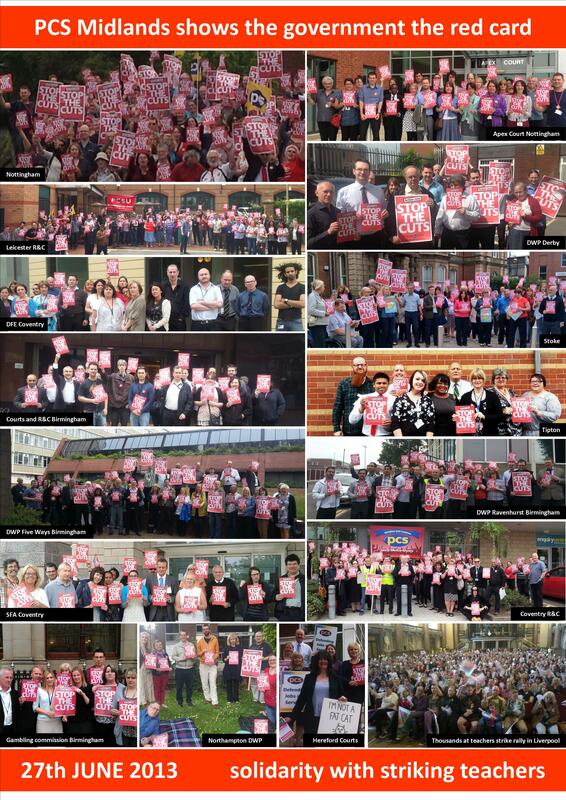 We organised a day of protest against these cuts – to pay, jobs and terms and conditions as part of our national campaign. 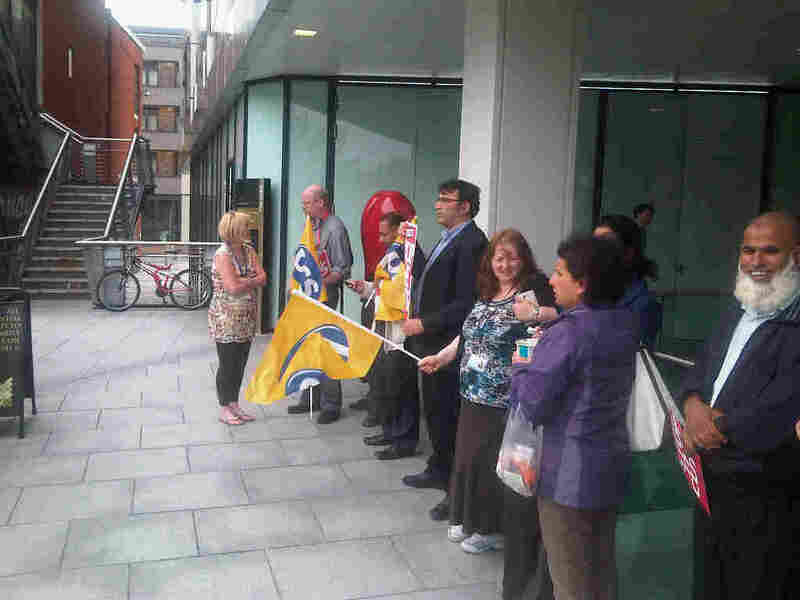 On 27 June, at every workplace and in our city centres, members protested to stop the cuts, and keep the pressure on ministers for real negotiations. 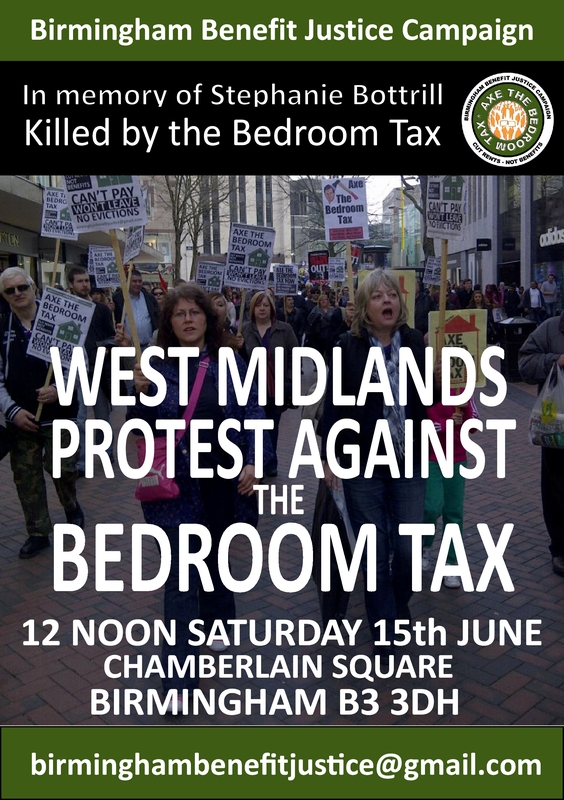 A demonstration against the bedroom tax will take place on Saturday in Birmingham, in memory of Stephanie Bottrill who committed suicide, blaming the government in her suicide note. Like many facing the bedroom tax, Stephanie was not able to find a smaller property to move to, and was only offered one six miles away from her support networks, friends and family. The demonstration on Saturday meets in Chamberlain Square at 12noon. The march will proceed down New Street onto High Street, up Union Street and Cherry Street to the Cathedral, down Temple street to New Street and back to Chamberlain Square. There will be a shortened route that stops at the junction on New St and Temple St, waiting for protesters to complete the long route before heading back to Chamberlain Square. Long march route: approx 1 mile. The march returns to Chamberlain Square so anyone who does not want to or cannot walk the short route can remain in Chamberlain Square. Birmingham City Centre is step free. Accessible toilets are available in Paradise Forum by Chamberlain Square, and a single person accessible public toilet is located in Victoria Square, less than 100m from Chamberlain Square. Various accessible toilets are available along the march route in the Pallisades, Bullring and Pavilions shopping centre, and in restaurants and pubs. 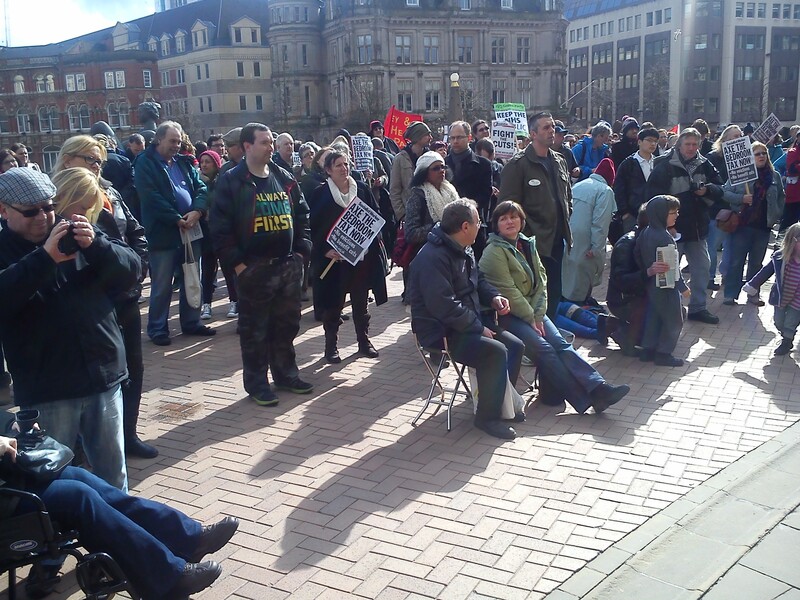 The campaign against the bedroom tax continued in Birmingham yesterday with a demonstration in the city centre attended by around a hundred people. 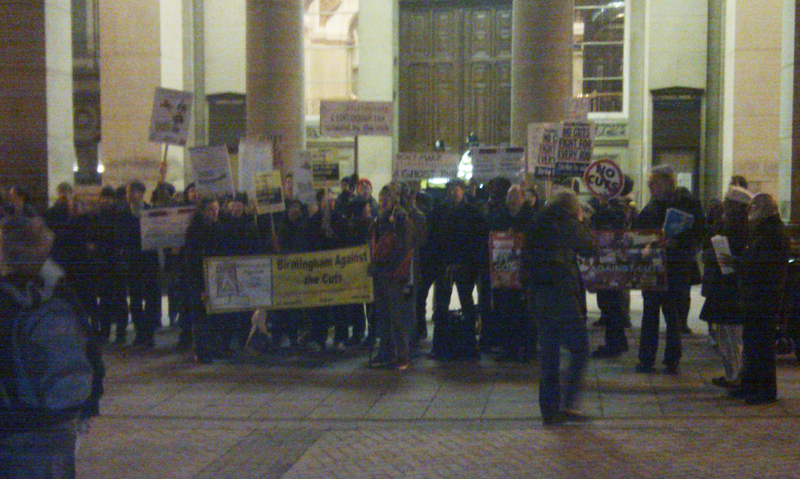 Called by the Birmingham Benefits Justice Campaign, this followed action last week that saw the council chambers occupied by activists calling on Albert Bore and the Labour council to commit to no evictions over bedroom tax arrears, and the demonstration last month which saw hundreds protest in Victoria Square. Hundreds of people came out to demonstrate against this coalition’s unpopular bedroom tax policy. One of the biggest anti-cuts demonstrations in the past couple of years saw the two sides of the Labour party speak in between amongst community activists and people affected by the bedroom tax, as John Mcdonnell MP and Liam Byrne MP both addressed the crowd – to rather different receptions. 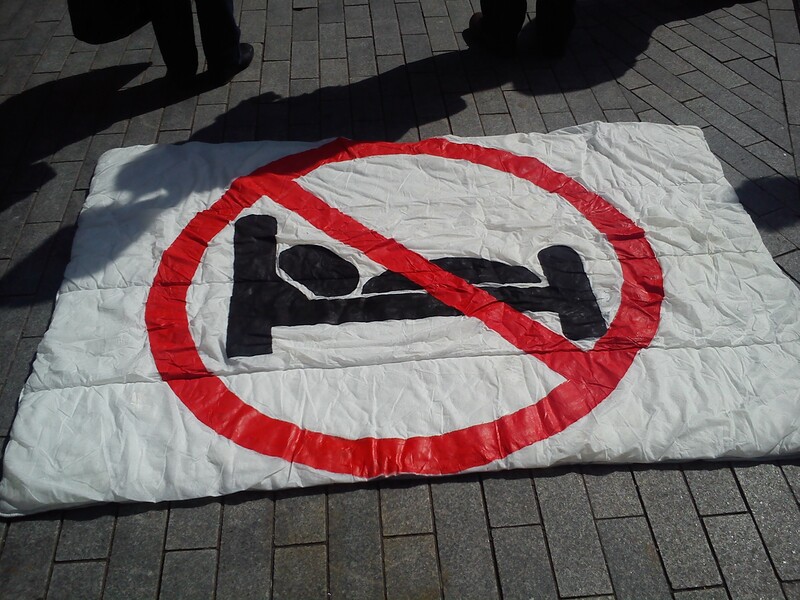 You can read more about the bedroom tax, and the “spare” rooms that aren’t spare in these posts – More concessions show we can defeat the bedroom tax and Birmingham bedroom tax demonstration. The Labour group met yesterday to agree internally their budget proposal which accepts the £110m of cuts to the council budget as a result of the Tory coalition slashing central government grants. The full council meets on Tuesday 26th February to discuss and vote on the proposals put forward. 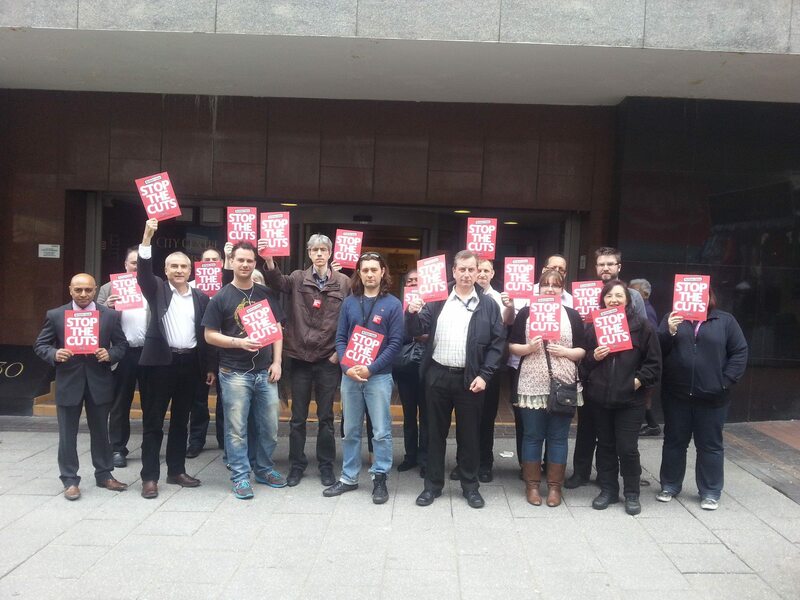 In protest at the cuts and the Labour group’s decision to implement them on behalf of the Tory coalition, 20 people occupied the council house balcony from lunchtime until 6pm, and a demonstration of around 200 people marched up New Street to the council house where the meeting took place. There was coverage of these actions in The Birmingham Mail and BBC Website. In the third year of this Condem coalition, austerity began to fail, with the budget deficit rising as we entered a double dip recession. The triple dip recession may already have started. The council here announced huge budget cuts spelling the “end of local government as we know it“, the attacks on our welfare system accelerated and the fightback continued with 200,000 marching in London on October 20th, thousands in Birmingham for the Tory conference, companies and charities withdrawing from workfare, Charles House saved from closure, Redundancies stopped at Connexions (at least for now) and more words (though still little action) on tax avoidance. Click on the photo to read about the event or campaign.